"I've been waiting for you, Obi-Wan. We meet again, at last. The circle is now complete. When I left you, I was but the learner; now I am the master." - Darth freaking Vader, man. But what do we say to Darth? Not today! Not today, Darth! Because this blade, this hand-forged lightsaber belonging to a Jedi Master isn't going to just pause and stand there while Darth Vader's lightsaber slashes through your robes and you suddenly vanish. No way. That was last time. This time, you're in charge, and you're going to take this lightsaber and spear it right through Darth Vader's stupid smirking face (is he smirking? We can't actually tell on account of the mask, but it definitely feels like he's smirking!). Search your feelings, Obi-Wan. You know it's true. 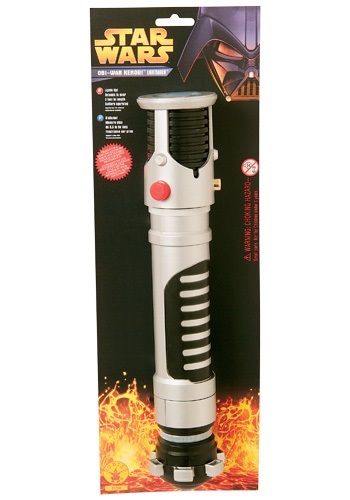 Use this lightsaber to rid the galaxy of the Sith, specifically this one Sith guy here. After that, you can keep using your lightsaber. It's not just for killing Sith. Slice your toast! Renovate your home! Attempt self-amputation! This thing is handy for basically any activity that requires a blade of energy for cutting through something. It pays for itself in no time!